Depending on the angle, the remains of the crushed pickup from the March 19 work zone crash are barely recognizable. regional displays for National Work Zone Awareness Week. Followed delivery of this heap of scrap to the east campus this morning. Had no idea what was so slowly being transported under the covering tarp but had a chance to view it later, on my return home. 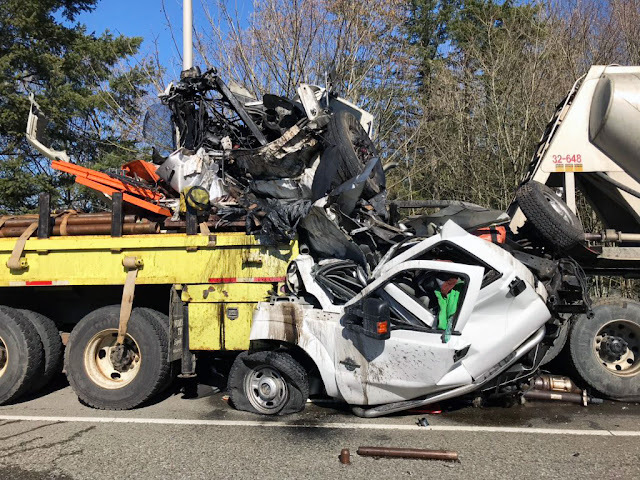 WSDOT's "highwayman" and crew had their guardian angel working overtime on that one. "So the state DOT is asking everyone on the road to slow down ... be kind ... pay attention ... and stay calm." Here's the thing: we see these articles all the time. There's always some wreck, often someone dies, and pretty much always preventable. The causing driver wasn't doing what they were supposed to, and instead was doing something they weren't supposed to. But, articles don't change behavior. Anyone reading the article and receptive to the requests, they are most likely already driving safely. Most people reading the article and thinking "well, thank goodness I'm a great driver", are sorely mistaken but could never be convinced otherwise. It's pretty much guaranteed that they tailgate and they speed, and there are better-than-even-odds that they run stop signs and red lights, fail to yield to pedestrians and cyclists, fail to signal turns, and a host of other dangerous driving practices. There are only two reliable avenues to improving motor vehicle safety: education and enforcement. And of course, in Washington we have essentially none of either. Most moving violations are never even noticed by law enforcement, and the rare ticket doesn't cost enough to motivate a change in behavior. You can kill someone with impunity using a motor vehicle, as long as you're not drunk, because prosecutors only want to take on the trivially easy cases. Continuing education for drivers? There's not even a hint of that, not even a pretense that anyone in the state cares about something like that. Until the powers that be get serious about implementing addressing the utter lack of these two critical components of safety, nothing is going to change. You can plead with the drivers all you want, but those pleas will fall on deaf ears. This is a very important point that was made about “Education”! There’s got to be more accountability! More “Laws” doesn’t fix anything! We agree education is important. Part of the reason we do public outreach like this is to help spread the safety message to residents. 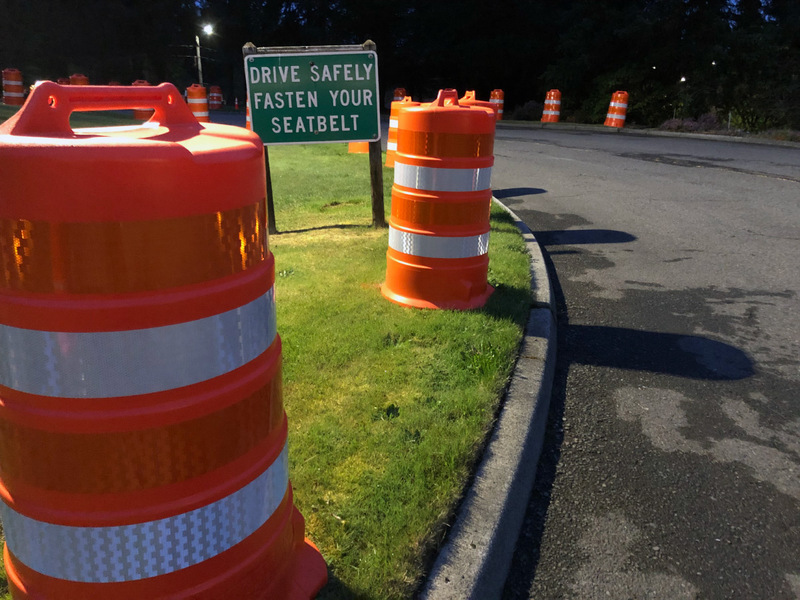 In addition, we worked with the Department of Licensing to add work zone safety and other items to the new Washington Driver Guide. 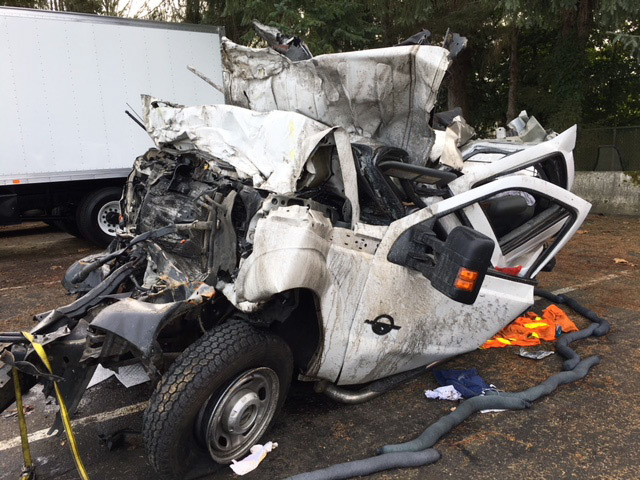 And, our partners in the Washington State Patrol are conducting a distracted driving emphasis this month to spread the message that drivers need to focus on the road, not electronic devices. We hope using a variety of approaches and messages helps reach as many people as possible. I don't have any quarrel with what education WSDOT tries to do. I appreciate it very much. But it's a drop in the bucket compared to what's needed. Likewise these "emphasis patrols". Law enforcement is so understaffed, that even during such patrols, the vast majority of violators are overlooked. I commute to work on bike. Taking just this afternoon's ride as an example: I was passed by a driver who used the bike lane to go around me while I was making a left turn, creating a hazard to the cyclist who was ahead of me in the same bike lane; two drivers in a row failed to yield as I crossed at a crosswalk; a third driver made a right turn directly across my path as I was moving through an intersection. Unfortunately, this is typical (i.e. at least one such event happens during each direction each day of my commute, and often there are multiple, such as today), and local law enforcement shows no interest in following up on documented reports, never mind actually monitoring the situation generally (I use cameras on my bike, and have submitted video evidence to local law enforcement for multiple such events, and they have not once made any sort of follow up with the driver involved, never mind issued a citation). Your efforts to educate are, as I said, very much appreciated, but WSDOT is just one piece of a much larger puzzle, and unfortunately neither WSDOT nor the other organizations have the resources to do the job that's needed, and many of those other organizations actively express disinterest in making an effort. I disagree with the naysayers here. I am a safe driver and do slow down for work zones. As an environmental scientist, I also may be parked on or off roads to take samples or photos. The article and photo reinforce to me the awareness that I probably shouldn't linger in or near the vehicle. Thank you for that reminder.